Hello! Katie and I have been working together the past few weeks preparing our Kickstarter proposal to Oban to record the migratory basking sharks and create a short film together. After much planning, we are ready to go! Please take a few minutes to read our proposal and share it with your friends. We appreciate any and all support in helping us get to Oban and film these amazing, vulnerable creatures. See our proposal video, learn more about Katie Wright and hear how we met at Kickstarter. "Wild Oban" combines travel, exploration, nature, folklore, and the production of a short narrative movie. We (Katie and Sofija) aim to create a film uniting local folklore elements with the real-life mystery of the elusive basking shark. We will travel to Oban, Scotland to document the island landscapes, Hebrides waters, and the basking shark. For an up-close thrill, we will even be swimming with these sharks! 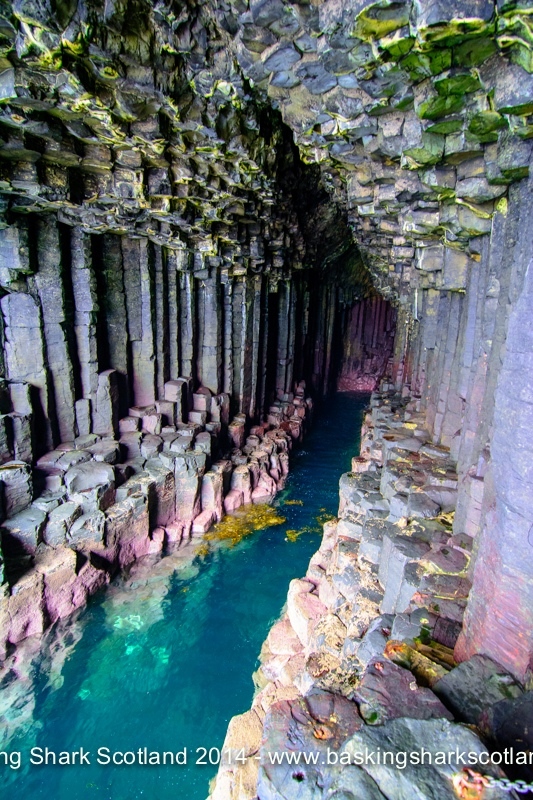 With the "Basking Sharks Scotland" boat and resources we will explore Oban, Lunga and Staffa, Fingal's Cave, Mull, and the Isle of Coll.We want to explore the splendor of these waters and islands to capture footage of this less traversed area of the UK. Before our trip starts, we will be preparing. Fortunately we have three whole months to research they sharks and the folklore elements through libraries, the internet, and historical, regional, a scientific museums and archives. Leaving from Newcastle on August 11th, we will take the train northwest to Oban where we will spend one night in a hostel. While on the Oban land we will be able to conduct local research on the folklore of the area in preparation for the following days on the water. From August 12-14th we will participate in the Three Day Shark Tour with Basking Sharks Scotland. Through snorkeling, swimming, kayaking, and sight seeing from the boat we will get real first hand experience with the Hebrides landscape and nature. It is also where we will encounter (and hopefully not be terrified by) the large basking sharks. This is when the majority of our recording will take place. We will shoot everything we experience with all the equipment in our arsenal including: multiple digital cameras, video recording, underwater film cameras, and sound recording equipment. The varying recording techniques will provide different effects that will be collaged together in our final film. Each day of our journey we will post updates and blog entries with the days' events and a preview photo or two so you can witness the process each step of the way.